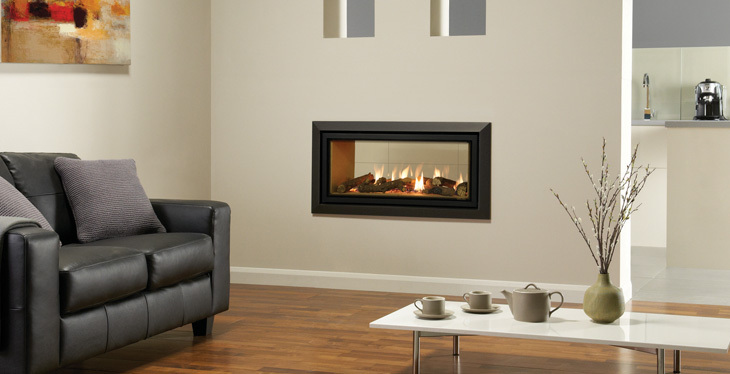 The Studio 2 Duplex gas fire offers unrivalled flame pictures in two rooms at once. Available in the popular Studio 2 size, this dual space fire is a much desired solution in having the best of both worlds. With a wealth of frame options to choose from, the Studio 2 Duplex gas fire can be styled completely independently on either side to maximise the potential of your own decorative tastes. To further enhance the many styling options, this stunning gas fire offers the additional choice of two firebox linings; contemporary vermiculite or timeless black reeded – both of which offer a unique and distinctly different look for your Studio Duplex fire. Sporting a stunning hand-painted, log-effect fuel bed complete with subtle glowing ember bed and giving a high efficiency rating of up to 82%, the Studio 2 Duplex not only provides an impressive visual focal point in two rooms, it also produces an impressive 7.9kW heat output. Fuel Bed: Log effect only. Command Controls: Programmable Thermostatic remote.